Russia will lander for a new mission "EkzoMars 2018"
MOSCOW, August 02, /ITAR-TASS/. Russian scientists will focus on Moon and Mars exploration and repeat the Phobos-Grunt mission in the next decade, Space Research Institute Director Lev Zeleny said on Saturday. “The Moon and Mars are our priority for 2016-2025,” he said at the 40th COSPAR Scientific Assembly underway in Moscow on August 2-10. The Federal Space Agency (Roscosmos) in partnership with the European Space Agency will be carrying out two stages of the ExoMars mission in 2016 and 2018. 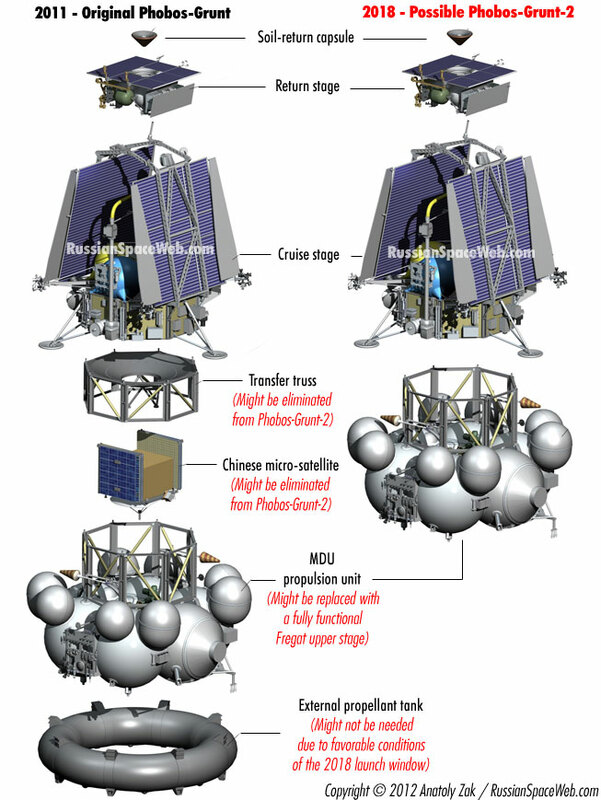 In 2016, Roscosmos is planning to join Europe and Japan in the BepiColombo project. In 2017, it will orbit the Spektr-RG telescope and send a Russian rover, Luna-Globe, to the Moon in 2019, for the first time in years. An UV observatory is to be launched in 2020; an orbiting module and a dropship are scheduled to be sent to the Moon in 2012 and 2023, respectively. After thoroughly testing lunar and Martian technologies, approximately in 2024, Russia, may repeat its Phobos-Grunt mission to Mars’ satellite Phobos to collect its soil and bring it back to Earth. Russia is planning a manned mission to the Moon in 2030-2031, Roscosmos First Deputy Head Alexander Ivanov said in July. “In our programme this [manned mission to the Moon] is scheduled for 2020-2031. This programme [Federal Space Programme for 2016-2025] is being coordinated now,” he said. When asked when the first settlement might be built on the Moon, Ivanov said this question was much more complex and needed additional attention. MOSCOW, August 04. /ITAR-TASS/. Russian specialists will create a new landing platform and several unique scientific instruments for ExoMars-2018, a joint exploration mission with their European colleagues, a space official said on Monday. “Under the current agreements, Russia will not only provide launch vehicles and some scientific instruments, but it will also create a landing module for the ExoMars-2018 mission,” Daniil Rodionov of the Space Research Institute, who is also the Russian manager of the joint project, said at the 40th COSPAR Scientific Assembly underway in Moscow on August 2-10. A dropship being created by the Lavochkin Production Association, will deliver the Russian landing platform and a European 300-kg Mars rover to the planet. 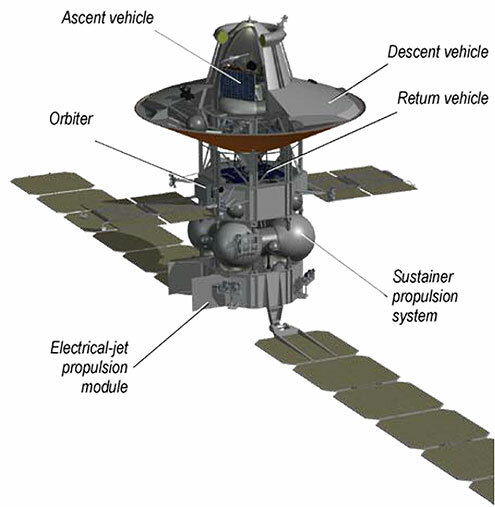 Stage One of the ExoMars project includes a European orbiting module and a dropship. The orbiting craft TGO (Trade Gas Orbiter) is intended for studying trace gas in the atmosphere and the distribution of water ice in Mars’ soil. The Space Research Institute is making two instruments for the TGO. One is intended for studying the chemical composition of Mars’ atmosphere and climate; the other one for chartering high spatial resolution maps showing the distribution of water ice in the upper layers of the planet’s soil and radiation monitoring equipment. The institute will hand over the instruments to the European Space Agency at the end of the year. After the rover with the Russian instruments rolls off the landing platform, the latter will start monitoring daily, seasonal and yearly processes on the planet’s surface. It is designed to operate for one Martian year (approximately 1.8 Earth years). Russia has also come closer than other countries to launching sustainable long-term manned space missions, Vladimir Uiba, head of the Federal Medical and Biological Agency told ITAR-TASS. “We expect positive results from experiments. Then we will be able to say whether or not we know how to provide for the vital life sustenance of cosmonauts during a long mission,” he said. Deputy Director of the Institute of Biomedical Problems, Oleg Orlov, said a biosatellite, Bion-M j 2, would be orbited as part of the program in 2019. It will be followed by another one, Bion-M j 3, approximately in 2022. Also, Vozvrat-MKA spacecraft will be launched in 2021 and 2025. Following the Phobos-Grunt launch fiasco in 2011, all planetary exploration and science projects in Russia faced uncertain future. Luna-Resurs and Luna Glob missions were now expected to fly no earlier than 2016 or 2017. According to unofficial sources, both projects were reverted back to the experimental phase, making possible another major redesign of the missions. In the meantime, in April 2012, the Indian space agency, ISRO, announced that Luna-Resurs would not fly until its GSLV rocket logs two successful missions beginning in September or October 2012. MOSCOW, October 3. /TASS/. Russian scientists have created a unique descent system for a Mars rover, Space Research Institute Director Lev Zelyony said on Friday. “Our European colleagues want to achieve maximum security for the rover so that it could roll onto Mars’ surface in any direction, if need be,” he said. “We have developed such a system. It has been decided to make two access ramps which will allow the rover to roll off the landing platform,” Zelyony said. Russian scientists will focus on Moon and Mars exploration and repeat the Phobos-Grunt mission in the next decade, Zelyony said earlier. MOSCOW, October 3. /TASS/. Russia has postponed the start of its automatic lunar exploration program from 2016 until 2018, Space Research Institute Director Lev Zelyony said on Friday. “They [the timelines] have been changed from 2016 to 2018. These are Luna Globe and orbiting Luna [program],” he said, adding that there should be no further delays. “We want to implement three lunar projects this decade: Luna-25, Luna-26 and Luna-27,” he said. Zelyony said these timelines have been set in the Federal Space Program proposed by the Federal Space Agency (Roscosmos). “The Moon and Mars are our priority for 2016-2025,” he said. A UV observatory is to be launched in 2020; an orbiting module and a dropship are scheduled to be sent to the Moon in 2012 and 2023, respectively. MOSCOW, October 10. /TASS/. Russia’s Federal Space Agency (Roscosmos) has worked out the outer space exploration program that also includes exploration of the Moon, Roscosmos representative Yuri Makarov told a news conference at TASS on Friday. “This year, together with the Russian Academy of Sciences, Kurchatov National Research Center, Rosatom (State Atomic Energy Corporation) we have prepared the outer space exploration program. It is ambitious not only in terms of funding, but also in terms of technical devices’ production,” he said. “The Moon is the program’s cornerstone,” the official added. Director of the Space Research Institute of the Russian Academy of Sciences Lev Zeleny said for his part that Russian cosmonauts in the middle of the next decade would fly over the Moon and by the end of decade may land on it. Initially, the Moon exploration will be conducted by the Luna-26 and Luna-27 automatic landers. Russia will need the European soft landing system for landing its Luna-Resurs probe on the Moon. The corresponding agreement between Roscosmos and the European Space Agency (ESA) is currently being considered by the Russian government, Maksim Martynov, first deputy chief designer of the NPO Lavochkin Research and Production Association, said Friday. “This project is planned to be implemented in international cooperation. The interagency agreement is now undergoing a reading procedure in the government under the aegis of Roscosmos in order to attract Western technology for the project,” Martynov said. “The time has come when no country is able to handle such major projects alone without international cooperation. Our European partners are expected to supply the safe landing system,” he added. The deputy head of the Russian Federal Space Agency (Roscosmos) stated that the works on ExoMars were well under way and two missions will be launched in 2016 and 2018. MOSCOW, January 12 (Sputnik) — Works on Russia-EU Mars research program ExoMars will be completed, and two missions will be launched in 2016 and 2018, Sergei Savelev, deputy head of the Russian Federal Space Agency (Roscosmos), said. "Works on ExoMars are well under way. Our partners from the European Space Agency have repeatedly reaffirmed their desire to implement the project together with Russia. 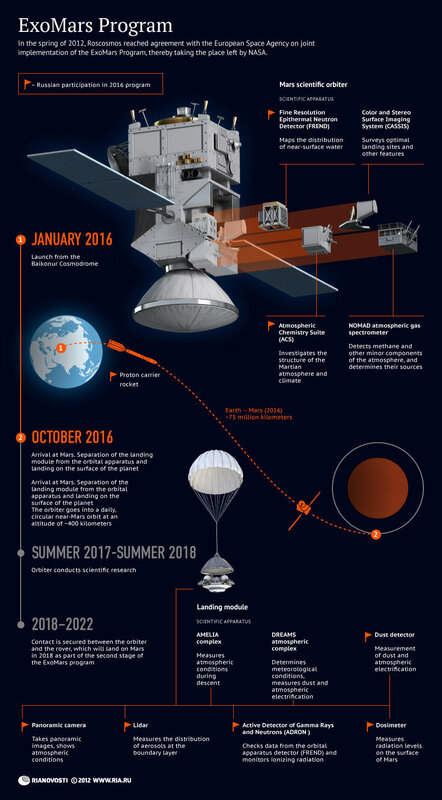 In 2016 a special Mars orbiter will be launched, and its main goal will be to explore the planet's atmosphere. Moreover, it will serve for the data exchange with the Mars rover," Savelev told Rossiyskaya Gazeta newspaper in an interview that will be released on Tuesday. According to Savelev, a lander will also descend on Mars to test soft landing. The main part of the program will be carried out in 2018, when a Mars rover with scientific instruments, including the Russian ones, will land on the planet. As published on the European Space Agency's website, two missions are planned within the ExoMars program for 2016-2018. In 2016, the ExoMars project will launch an orbital probe to Mars, followed by the landing on the Martian surface of a lander module. In 2018, a Martian rover probe will be launched to explore the surface of the planet. In 2012, the European Space Agency and the Russian Federal Space Agency (Roscosmos) agreed on developing the so-called ExoMars program with an objective to investigate the Martian environment and to find out whether life ever existed on the planet. After the United States and its allies introduced several rounds of sanctions over Russia’s alleged role in escalating the Ukrainian crisis, there have been fears that Europe-Russia collaboration in Mars exploration could be hampered. Misleading tittle, i thought it was a manned mission, lame. crystal design (e.g. using silicon nitride circuits). MOSCOW, April 1. /TASS/. Russian scientists have been planning a new space mission to Ganymede — the biggest Jupiter's moon, Director of the Skobeltsyn Institute of Nuclear Physics (SINP) Mikhail Panasyuk told TASS. The project undertaken jointly with Institute for Nuclear Research of the Russian Academy of Sciences is in a preliminary stage yet when the shape of a space apparatus and a set of scientific equipment on board are being planned and the main goals of the space project are being determined, Panasyuk said. The scientists are to resolve the task of protection of the space apparatus from the most powerful radiation, he said. Jupiter is an absolutely horrible planet in terms of radiation, which is hundred thousand times stronger near any of Jupiter’s moons than in the radiation field anywhere around the Earth, he said. During the space mission the space apparatus will fly around one of the Jupiter's moons with no touch down planned. The estimated radiation-proof parameters of the equipment on board indicated that the space research apparatus might be present on the surface of Jupiter’s moons for no more than a few dozen minutes. "No such radiation-proof equipment exists yet,"Panasyuk said. SINP experts have been working on a project called "Intergelio-Zond» for studies of the Sun, which will be launched after 2020. Negotiations with the European Space Agency are underway. The goal is to create an "Intergelio-Zond" system which could operate synchronously with the other European projects, Panasyuk said. The "Intergelio-Zond" project, intended for studies of the Sun from a close distance equal to 30-40 Sun radiuses, aims to resolve problems of overheated Solar crown, growing wind force and prevention of the most powerful outbreaks of Solar activity-Solar flares. The dates of launching the space research apparatuses will be specified in the framework of a new Federal space research program expected to be adopted in the next few months. Guys, recently found this article and wondered whether the Russia's nuclear space engine will employ a similar if not exact propulsion method? AlfaT8 wrote: Guys, recently found this article and wondered whether the Russia's nuclear space engine will employ a similar if not exact propulsion method? I love VASIMR technology, been following it for years. In general little progress has been made on it in that amount of time. Russia has alternate technology in development. MOSCOW, April 17. /TASS/. Russia plans to spend around 776 million rubles (almost $15 million at the current exchange rate) for preparing and launching the ExoMars mission jointly with European Space Agency, Russian space agency Roscosmos said on Friday. "The price of the state contract is set at 776.3 million rubles," the agency said. It is planned to spend 239.9 million rubles ($4.6 million) in 2015 and remaining 536.4 million rubles ($10.3 million) in 2016. The ExoMars Gas Orbiter is planned to be launched on the Proton-M rocket carrier from the Baikonur spaceport in January 2016. It will land on Mars on October 2016 and will proceed with mapping the sources of methane on Mars and other gases. It will also help select the landing site for the ExoMars rover. The scientific objectives of the mission include searching for possible biosignatures of Martian life, studying the surface environment and characterizing the water and geochemical distribution on the planet. The agreement on the joint mission was signed between the European Space Agency and Roscosmos in March 2013. MOSCOW, May 4. /TASS/. The Russian Federal Space Agency (Roscosmos) plans to launch a new sample soil expedition to Mars’ satellite Phobos, according to a draft of Russia's new space program for 2016-2025 unveiled on Monday. Under the document, the Mars-Grunt (Soil) expedition is planned for 2024 to deliver soil samples from the Martian moon Phobos to the Earth. The project is estimated at 10.3 billion rubles ($198 million). This sum is twice as large as the amount stipulated in the draft federal space program prepared last year. Roscosmos plans a new interplanetary expedition after a failure of its previous Phobos mission. The Phobos-Grunt interplanetary probe was launched into a near-Earth orbit on November 9, 2011. The probe was expected to reach the Mars orbit and simultaneously land a module on Mars’ natural satellite Phobos for exploration and the delivery of soil samples to the Earth. However, the interplanetary probe was unable to reach the trajectory of its flight to Mars due to an engine failure and stayed in the near-Earth orbit. The probe's debris fell to the Earth on January 15. According to Russia’s Defense Ministry, the Phobos-Grunt probe’s fragments that did not burn in the dense layers of the atmosphere fell into the Pacific Ocean 1,250 km (777 miles) west of Wellington Island (Chile). I also just read it on TASS. I think it's great we are seeing a restart of this mission. The Martian moons are very interesting objects, it was a real shame the original mission never succeeded. Roscosmos issued a tender for preparation of a technical proposal for development of a spacecraft designed to deliver soil samples from Phobos (satellite of Mars) to Earth. The corresponding documents were posted at the website dedicated to state procurement, TASS reports. “The aim is to prepare a technical proposal for development of Bumerang spacecraft designed for exploring satellites of Mars – Phobos and Deimos, as well as delivering soil samples from Phobos to Earth,” said in the documents. According to the draft Federal Space Program, Roscosmos is going to repeat a mission aimed at getting the soil samples from Phobos (natural satellite of Mars) in 2024. According to the document, the spacecraft will be launched in 2024 in the network of Ekspeditsiya-M (Mars-Grunt) project. The mission assumes delivery of the soil samples from Phobos to Earth. 10,3 billion rubles will be allocated for this project during 2016-2025 period. This is twice as much as a sum specified in the draft program elaborated last year (5,1 billion rubles). In addition, the launch of the spacecraft in the previous version of the program was scheduled for 2025. Russia's spacecraft, projected to land on the moon in 2019, is undergoing trials. LE BOURGET (Sputnik) – Russia’s lunar research is currently undergoing “Earth trials” before landing on the moon in 2019, a Russian delegation member connected with the development of the space vessel said at an airshow outside Paris on Friday. “As of today, the main construction documentation has been started and the models for independent and complex trials have been prepared,” the delegate said. Russia plans to land a research vessel, called Luna-25 (Moon-25) on the moon’s polar region instead of the equator, where all other landings have been centered. Russian scientists decided to land the spacecraft on the south pole of the moon, as they consider it an area of particular interest. The researchers plan to explore internal structure of the moon and the impact of the cosmic rays and electromagnetic radiation on the lunar surface, and to search for natural resources in the area. The launch of a space probe to Mars under a joint Russia-EU research program will be delayed until March 14, 2016, for technical reasons, a Russian space industry source said Friday. MOSCOW (Sputnik) — The launch of a Russian Proton space rocket carrying the ExoMars-1 orbiter from the Baikonur space center in Kazakhstan was originally scheduled for January 7, 2016. According to the source, an official confirmation of the delay is expected to be announced shortly. "The launch will be postponed due to two technical issues, which are not in the scope of Russia's responsibility," the source said. "There's nothing alarming in the delay as the 'launch window' allows us to carry out the launch on March 14 and deliver the spacecraft to Mars, with the help of Proton, on time," the source stressed. In 2012, the European Space Agency and the Russian Federal Space Agency Roscosmos agreed to develop the so-called ExoMars program, with the objective of investigating the environment on Mars and finding out whether life has ever existed on the planet. As published on the European Space Agency's website, two missions are planned within the ExoMars program for 2016-2018. In 2016, the ExoMars project will launch an orbital probe to Mars, followed by a landing on the Martian surface by a lander module. In 2018, a Mars rover probe is expected to explore the surface of the planet. After the European Union introduced sanctions against Russia over its alleged role in the Ukrainian internal crisis, concerns mounted that Europe-Russia collaboration on Mars exploration could be hampered. Russia's Space Research Institute is building a space probe to send to the Moon, which will allow Russian scientists to carry out scientific research on the Moon's surface for the first time since unmanned Soviet spacecraft landed there in the 1970s. The Russian Space Research Institute has given Gazeta.ru an exclusive look at the engineering of the Russian space probe which will be the first to land on the Moon' surface since 1976, and give Russia's researchers the opportunity to explore the Moon' surface in depth. "The main difference from Soviet missions, which brought back space material to Earth, is that research will be carried out directly on board the probe," explained Vladislav Tretyakov, a researcher in nuclear planetology at the Russian Space Research Institute [IKI]. "Secondly, we must ensure survival during lunar nights, which back then was only achieved only by our 'Lunokhod' rover." "And of course, this is the first polar mission, insofar as all the previous missions, including ours and those from other nations, were [conducted] at equatorial latitudes." 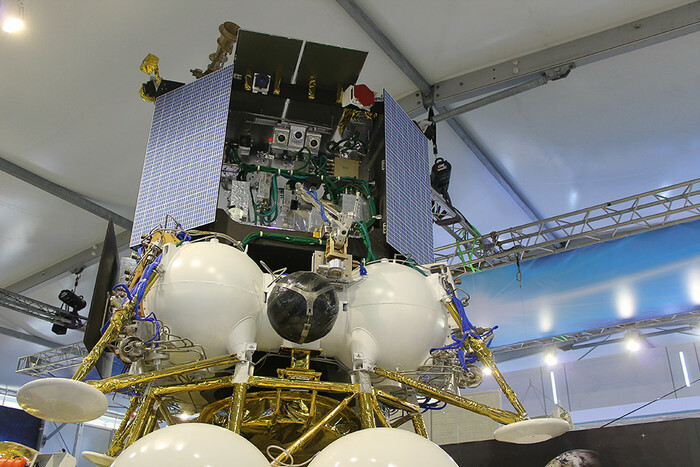 Most of the instruments for the spacecraft, named 'Luna-Globe' are being made at the IKI; a life-sized model of the probe is currently being exhibited for visitors to the International Air Show in the Moscow suburb of Zhukovsky. The probe is slated to land in 2016 in the Boguslavsky crater, near the Moon's South Pole, where its four television cameras will immediately begin taking footage of the area. Another two cameras will observe the work of the probe's digging tool and a further two will assist it so that it might move around safely. In order to survive the harsh nighttime conditions on the Moon, when the temperature can fall from daytime highs of 123 degrees celsius to as low as minus 153 degrees, Luna-Globe is fitted with a radioisotope thermoelectric generator, which provides power by converting the heat generated by the decay of the plutonium-238 isotope into electricity. The probe's digger, which itself is fitted with an infra-red spectrometer, will hand its findings to the probe's laser mass and neutron gamma spectrometers for analysis. Another instrument will study the composition of the thin lunar atmosphere, while ceramic plates on the probe will inspect the surface to determine the size, speed, and energy of its dust. In addition to the instruments built at the IKI, a device made by the Vernadsky Institute of Geochemistry and Analytical Chemistry will study the thermal properties of lunar soil. Like the 'Lunokhod' and the US Apollo space missions before it, the reflectors which Luna-Globe takes to the Moon will allow mission scientists to track its smallest movements, and in such a way investigate its internal structure. "This mission is a scientific-technological one. We want to carry out scientific experiments there, but this is a technological mission in the sense that we need to return to the Moon, learn how to land, and survive the lunar night, since a lot of what was achieved in the 1970's has been forgotten," explained Tretyakov. "We Need to Return to the Moon" — Journalists from gazeta.ru explored the Luna-Globe in detail. The Russian Space Research Institute, where the spacecraft is being constructed, was founded in 1965 under the auspices of the Academy of Sciences of the USSR, and is now part of the Russian Academy of Sciences. The most important IKI missions were conducted in the 1970s, notably the Venera spacecraft mission series; the Venera ships were the first spacecraft to enter another planet's atmosphere, make a soft landing, and return images and high-res radar mapping studies; Venera remains the only spacecraft to have completed a successful landing on Venus. In the 1980s and 90s, despite financial difficulties, IKI managed to lead two particularly successful scientific projects; the Interball project to study various plasma processes in the Earth's magnetosphere, and the Granat X-ray and gamma ray astronomy mission to carry out deep imaging of the galactic center and study black hole candidates. Since the 2000s, the IKI has been involved in a range of international research collaborations, including the Mars Odyssey and Mars Exploration Rovers with NASA, and the Mars Express, Venus Express and INTEGRAL missions, carried out jointly with the European Space Agency. Russian cosmonauts are expected to make their first steps on the Moon in 2029. MOSCOW (Sputnik) – A manned lunar landing by Russian cosmonauts is planned for 2029, the head of the Russian Space Agency Energia said Tuesday. “A manned flight to the moon and lunar landing is planned for 2029,” Vladimir Solntsev said during a space technology conference in Moscow. The Energia chief, a spacecraft components manufacturer, said Russian scientists were building a new spacecraft made of composites specifically for moon missions. Its maiden flight is scheduled for 2021. In 2023, the spacecraft is due to dock with the International Space Station, with the first unmanned lunar mission set for 2025. According to earlier reports, Russia plans to land a Luna-25 research vessel on the south pole of the moon instead of its equator, where all other landings have been centered. The plan is to explore the internal structure of the Earth’s only natural satellite and the impact of the cosmic rays and electromagnetic radiation on its surface, as well as to look for natural resources in the area.